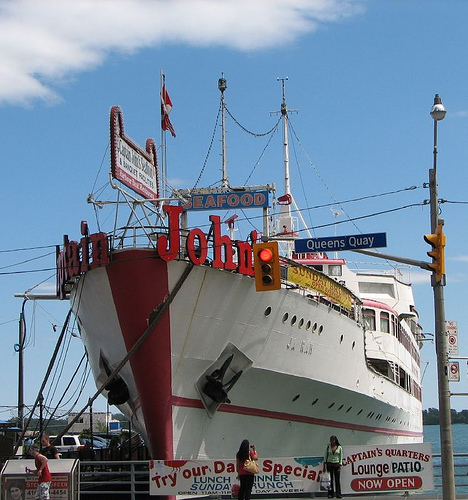 I've never been to Captain John's floating restaurant in the water at Yonge and Queen's Quay. I've walked by it a hundred times but never felt the urge to go inside. Now, it's possible I'll never get that chance. Waterfront Toronto rescinded its lease for the watery slip at the foot of Yonge St. Tuesday and warned “Captain” John Letnik that he has until July 27 to remove everything, including the ship’s weather-beaten signs. At the same time, the City of Toronto shut off water to the ship and a health department inspector ordered the restaurant closed because staff would be unable to wash utensils or their hands. It seems Letnik owes more than $500,000 in back taxes, rent and insurance on the slip and 300-foot ship. Is this the end of Captain John's Restaurant, a Toronto landmark since 1970? Such a shame. It seems this city is losing a lot of its character. How is this "a shame"? This hulk is an eyesore and a tourist trap that did nothing except leave a bad taste in the mouths of visitors to the city (lliterally, from what I've read). There's a reason you can't find anyone in the GTA who's actually ever eaten there, folks, and there's a reaon why no one has stepped up and bought this scow. It's been up for sale for years now, originally for 1.5 million. They dropped the price, but surprise! No takers. I have never been it either, but based on what it looks like, I never would eat there. Move it it Clearwater Florida..
Once this floats away, the waterfront will look so much better. Never been...my dad ate there once and never again...outside of the small novelty of eating fish on a big boat, what's the loss? There are many far superior seafood restaurants in T.O. Idea: Let's replace Captain John's with the old Sam the Record Man sign! There was an article in the paper a few weeks ago about how Captain John's used to be a swanky place to be in the city - celebs and everything even! Very interesting. I remember in Grade One someone brought in a picture of Captain John's Restaurant sunk. I remember being amazed that a restaurant was on a boat and now it was underwater. I think it sunk when the Toronto Island Ferry crashed into it. It was a place to go in the 70's for sure, i remember my parents going and loving the atmosphere. Oh the key parties there in the '70s... good times, good nautical times. I have never eaten there either. Would you actually be riding in the boat while you ate? Oh well, no big loss. 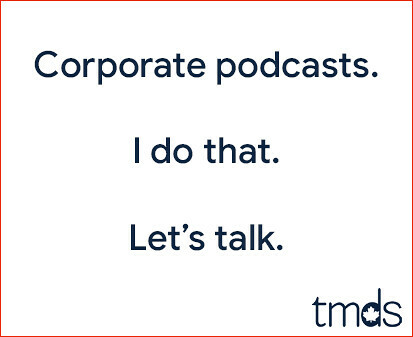 I never heard of it until this week. "It's a good thing my wife and I have been to Toronto on many occasions and have had some great cullinary experiences otherwise our thoughts of Torontonian restaurants would forever be tarnished by this floating Turd of the seas." "Sweet God in heaven how does this place manage to stay in business? The sign out front claims Captain John's serves 'The Best Seafood in Toronto'. Having eaten there, this absurd claim is like saying Hitler was a humanitarian." "In short, stay as far away from this boat of horrors as you possibly can, and be sure to enjoy the many amazing dining experiences Toronto has to offer. If I could rate Captain John's a zero or lower, I absolutely would." "I have recurring nightmares of this place thats all i have to say." "Mayor Miller and company should put everything on the backburner and focus on shutting down this blight on Toronto cuisine." "Wait staff looked like they were kidnapped from an old folks home. Our waiter had to be 90 yrs. old. Got our orders wrong. Forgot our drinks and smelled of moth balls." That thing is kind of an eye sore. Then again, so is a lot of the waterfront due to bad planning. Only 17 comments? C'mon, we can do better... Leave a comment above and let's keep this conversation going!